Describing laughter: The sound is produced by a deep inspiration followed by short, interrupted, spasmodic contractions of the chest, and especially the diaphragm... the mouth is open more or less widely, with the corners drawn much backwards, as well as a little upwards; and the upper lip is somewhat raised. If we may believe our logicians, man is distinguished from all other creatures by the faculty of laughter. In The Spectator (26 Sep 1712), No. 494, as collected in Vol. 7 (1729, 10th ed. ), 84. Laughter is a most healthful exercise; it is one of the greatest helps to digestion with which I am acquainted; and the custom prevalent among our forefathers, of exciting it at table by jesters and buffoons, was in accordance with true medical principles. In George Moody, The English Journal of Education (1858), New Series, 12 , 411. Laughter that occurs during tickling of the axillary region and the soles of the feet, as well as the laughter that occurs when seeing comical things or when hearing comical things, has no practical diagnostic significance. As quoted in Fred Rosner, The Medical Legacy of Moses Maimonides (1998), 55. Science will never be able to reduce the value of a sunset to arithmetic. Nor can it reduce friendship or statesmanship to a formula. Laughter and love, pain and loneliness, the challenge of beauty and truth: these will always surpass the scientific mastery of nature. 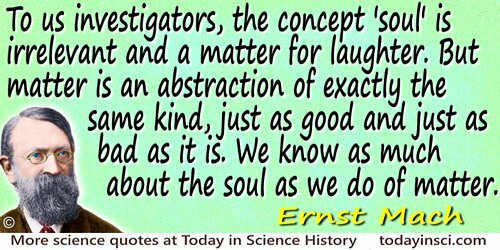 To us investigators, the concept ‘soul’ is irrelevant and a matter for laughter. But matter is an abstraction of exactly the same kind, just as good and just as bad as it is. We know as much about the soul as we do of matter. 'Die Geschichte und die Wurzel des Satzes von der Erhaltung der Arbeit' (1872). Trans. Philip E. Jourdain, History and Root of the Principle of the Conservation of Energy (1911), 48. Peter Pan (1904), Act 1. [As a science hobbyist, hoping to become famous someday, Artie Pinsetter (Lou Costello):] They also laughed at Einstein and his theory of relativity. Now everyone has relatives. From movie The 30-foot Bride of Candy Rock (1959). Writers, Rowland Barber and Arthur A. Ross. In Larry Langman and Paul Gold, Comedy Quotes from the Movies (2001), 289. This movie, (with its rare appearance of Costello without Bud Abott, his usual comedy partner), was released later in the year of Costello's death.